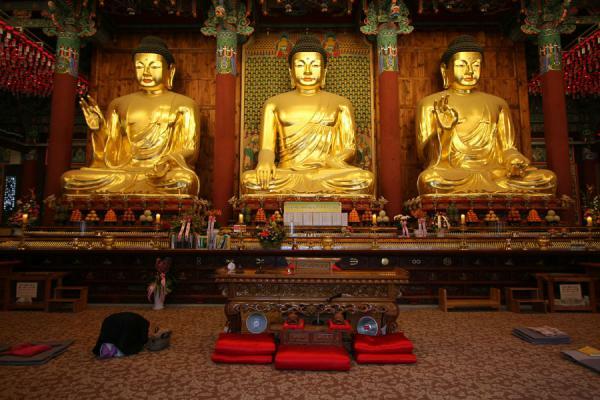 If you've ever visited a Korean temple for more than just the 산채 비빔밥 (mountain vegetable bibimbap), you've witnessed a procession of Buddhist followers removing their shoes, entering the temple doors, bowing three times (or more) in front of a giant Golden statue of Buddha, and leaving. If you ever dismissed this behavior as nothing more than simple idol worship - lord knows I always did! - you missed the point. Big time. Although there does happen to be a giant golden statue of a buddha in the temple, and the practitioners do bow in front of it, they are not actually bowing to the statue, or even to Gautama, the one they call the Buddha. (Ok, maybe one or two of them are. But think of them as the crazy lady teetering in front of the train station who blows her nose on her dress.) When you bow in a Buddhist temple, you are bowing to a more tangible buddha - the one inside of you. 1. A half bow: Enacted by bending at the waist, palms pressed together in front of chest. Performed at the beginning and end of a full bow sequence, whenever they see a monk (to recognize the buddha inside of them), and pretty much whenever they enter or exit a building on the temple grounds. 2. A full bow: Usually with a thick cushion in front, bowers will press their palms together in prayer position, kneel on the pillow, and lay their forearms and forehead on the ground in front of them. With the forehead still on the ground, they will turn their palms face-up and raise them above their ears. Then back down again, a return to kneeling position, and a roll-back onto the toes and they're up and voila! that's one. When Korean Buddhists enter a temple (shoes off and through the SIDE door, please - the main door is for monks only! ), they find an open spot on the floor, and perform a sequence of three bows (or three half-bows, if they are lazy, handicapped, or tired): one half bow followed by three full bows followed by one half bow. More dedicated (or bored) followers will tackle a full 108 bows (or more): one half bow followed by 108 full bows followed by one half bow.